It’s been so hot this entire week, you can imagine how hot if 6.30 am looks 10 am. So it’s been such a pleasant surprise to have the sudden showers blessing us. Since last night it’s been raining and the city dwellers were in for a nice day. Most of them enjoyed the entire day by going out and I am sure it will continue so for couple of days. I dread the hot summer again. Today being a holiday for the boys, they were out of ideas on how to spend the whole day. Athamma was worried how they will manage their summer vacation that will soon start shortly. Though they look short of ideas, you will be impressed on how they keep themselves so well occupied. Peddu made his breakfast clear saying he wants Appam, while Chinnu wanted Chocos, their latest addiction. Seeing him opt for that, Peddu cancelled his order and wanted the same as his brother. Konda has thought them to say “Order Order” when they all sit down to eat. Which only happens for couple of dishes. Rest you can either see Athamma running around or me doing the honours of feeding them. They eat themselves only if its appams and when one is done, they will call out Order Order, they even tip me after their meal. So it’s kind of fun to see how they go about. Coming to recipe today, since it’s raining, I thought I might post this deep fried delight. 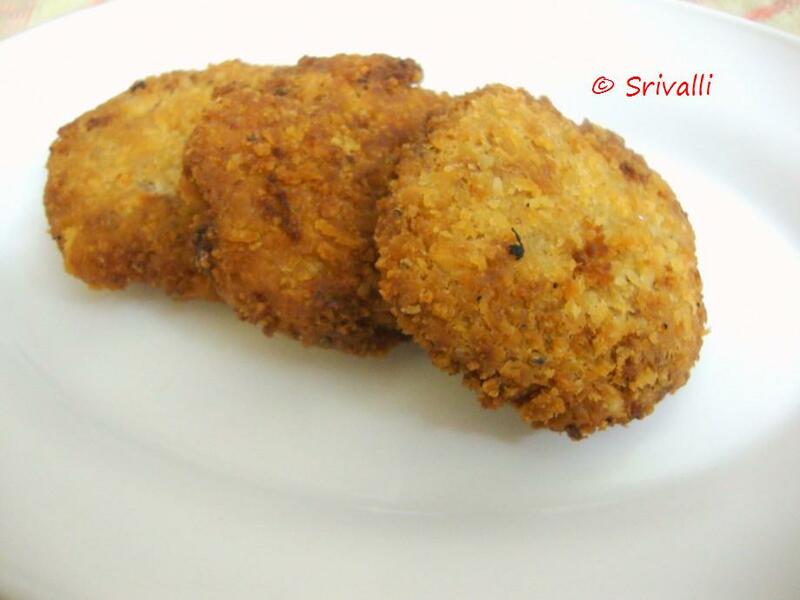 An innovative dish that Athamma thought of and we ended up making it often. It’s made with Freshly grated Coconut with Besan and spices. You can shallow fry it, if you want to avoid the oil. Else it tastes great. Sprinkle little water just enough for it to hold together. Divide into equal balls, and flat them into round vadas. Make sure they hold their shape. Add just enough water for the mix to hold the shape. In the pan, add very little oil for the vadas to be immersed and not as you deep fry your regular fritters. You will feel the crunchy taste of Coconut when you bite into it. 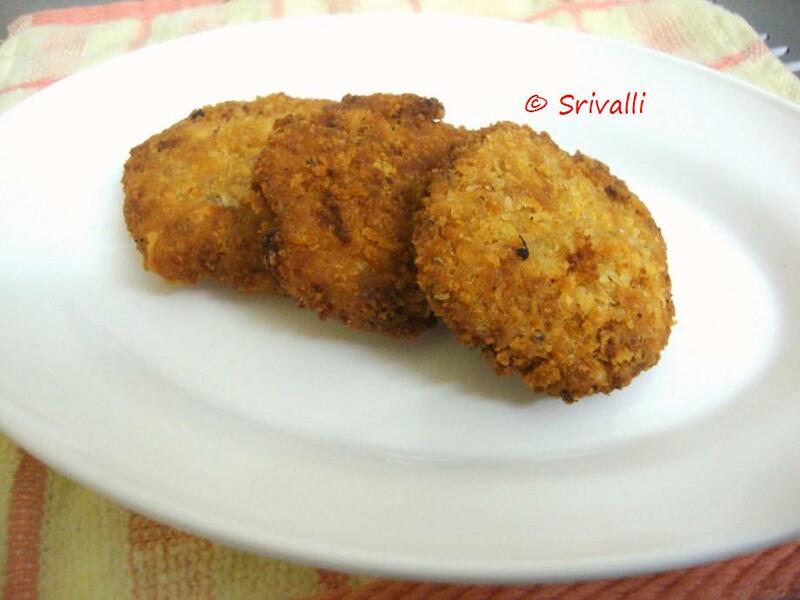 Enjoy your Vadas with a cup of coffee! Lovely idea. I have so many coconuts I dont know what to make out of them. this is a definite to do.Thanks. Soo crispy and fantastic fritters…marvellous! This is very different one. Nice thinking. YUM! Very innovative. Liked the idea of shallow frying. Very innovative and bookmarked. I am sure this will be a treat for the coconut lovers. You have a lovely space. I am a new blogger .. drop by my blog when you get a chance. Easter greetings from the land of coconuts! I found your blog thanks to Rebecca from "Chow and Chatter". What a gold mine of flavors you have here. I can spend hours reading to all your delicious recipes.